Why Do Colombia & Venezuela Hate Each Other? ContentsCompulsory voting is a system in which electors are obliged to vote in elections or attend a polling place on voting day. If an eligible voter does not attend a polling place, he or she may be subject to punitive measures such as fines or community service. 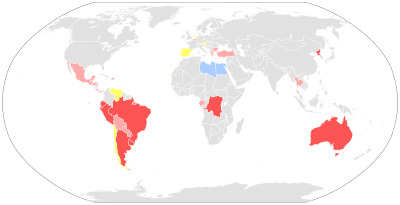 As of August 2013, 22 countries were recorded as having laws for compulsory voting and 11 of these 22 countries as enforcing these laws in practice. Athenian democracy held that it was every citizen‘s duty to participate in decision making, but attendance at the assembly was voluntary. Sometimes there was some form of social opprobrium to those not participating. For example, Aristophanes‘s comedy Acharnians 17–22, in the 5th century BC, shows public slaves herding citizens from the agora into the assembly meeting place (pnyx) with a red-stained rope. Those with red on their clothes were fined. This usually happened if fewer than 6,000 people were in attendance, and more were needed for the assembly to continue. Supporters of compulsory voting generally look upon voter participation as a civic duty, similar to taxation, jury duty, compulsory education or military service; one of the ‘duties to community’ mentioned in the United Nations Universal Declaration of Human Rights. They believe that by introducing an obligation to vote, it helps to overcome the occasional inconvenience that voting imposes on an individual in order to produce governments with more stability, legitimacy and a genuine mandate to govern, which in turn benefits that individual even if their preferred candidate or party isn’t elected into power. Compulsory voting systems can confer a high degree of political legitimacybecause they result in high voter turnout. The victorious candidate represents a majority of the population, not just the politically motivated individuals who would vote without compulsion. Compulsory voting also prevents disenfranchisement of the socially disadvantaged. In a similar way that the secret ballot is designed to prevent interference with the votes actually cast, compelling voters to the polls for an election reduces the impact that external factors may have on an individual’s capacity to vote such as the weather, transport, or restrictive employers. If everybody must vote, restrictions on voting are easily identified and steps are taken to remove them. Countries with compulsory voting generally hold elections on a Saturday or Sunday to ensure that working people can fulfill their duty to cast their vote. Postal and pre-poll voting is provided to people who cannot vote on polling day, and mobile voting booths may also be taken to old age homes, hospitals and remote communities to cater for immobilized citizens. If voters do not want to support any given choice, they may cast spoilt votes or blank votes. According to compulsory voting supporters, this is preferred to not voting at all because it ensures there is no possibility that the person has been intimidated or prevented from voting should they wish. In certain jurisdictions, voters have the option to vote none of the above if they do not support any of the candidates to indicate clear dissatisfaction with the candidate list rather than simple apathy at the whole process. Another perceived benefit of the large turnout produced by compulsory voting is that it becomes more difficult for extremist or special interest groups to get themselves into power or to influence mainstream candidates. Under a non-compulsory voting system, if fewer people vote then it is easier for lobby groups to motivate a small section of the people to the polls and influence the outcome of the political process. The outcome of an election where voting is compulsory reflects more of the will of the people (Who do I want to lead the country?) rather than reflecting who was more able to convince people to take time out of their day to cast a vote (Do I even want to vote today?). Other advantages to compulsory voting are the stimulation of broader interest politics, as a sort of civil education and political stimulation, which creates a better informed population. Also, since campaign funds are not needed to goad voters to the polls, the role of money in politics decreases. High levels of participation decreases the risk of political instability created by crises or charismatic but sectionally focused demagogues. There is also a correlation between compulsory voting, when enforced strictly, and improved income distribution, as measured by the Gini coefficient and the bottom income quintiles of the population. Voting may be seen as a civic right rather than a civic duty. While citizens may exercise their civil rights (free speech, right to an attorney, etc.) they are not compelled to. Furthermore, compulsory voting may infringe other rights. For example,Jehovah’s Witnesses and most Christadelphians believe that they should not participate in political events. Forcing them to vote ostensibly denies them their freedom of religious practice. In some countries with compulsory voting, Jehovah’s Witnesses and others may be excused on these grounds. If however they are forced to go to the polling place, they can still use a blank or invalid vote. Similarly, compulsory voting may be seen as an infringement of Article 2 of the Universal Declaration of Human Rights, which guarantees freedom of political opinion and thus the right of citizens to believe in a political system other than a democratic one, such as an absolute monarchy. However, it may also be argued that citizens may legitimately be required to vote since the right to believe in a different political system does not conflict with the obligation to conform with legal requirements of the system in place. Another argument against compulsory voting, prevalent among legal scholars in the United States, is that it is essentially a compelled speech act, which violates freedom of speech because the freedom to speak necessarily includes the freedomnot to speak. Some do not support the idea of voters being compelled to vote for candidates they have no interest in or knowledge of. Others may be well-informed, but have no preference for any particular candidate, or may have no wish to give support to the incumbent political system. In compulsory voting areas, such people often vote at random simply to fulfill legal requirements: the so-called donkey vote may account for 1–2% of votes in these systems, which may affect the electoral process. Similarly, citizens may vote with a complete absence of knowledge of any of the candidates or deliberately skew their ballot to slow the polling process or disrupt the election. Low voter participation in a voluntary election may not be the result of political apathy. It may be simply an expression of the citizenry’s political will, indicating satisfaction with the political establishment in an electorate. Italy – Introduced in 1945, abolished in 1993. Netherlands – introduced 1917 along with universal suffrage, abolished in 1967. Every person absenting himself from an election, and shall neglect to give in his or their ballot at such election, shall be subject to a penalty not exceeding five pounds; the mode of recovery and also the appropriation thereof, to be pointed out and directed by act of the legislature: Provided, nevertheless, That a reasonable excuse shall be admitted. This provision was omitted from the revised Georgia constitution of 1789. As of August 2013, 22 countries were recorded as having compulsory voting. Of these, only 10 countries (and one Swiss canton) enforce it. Of the 30 member states of the Organisation for Economic Co-operation and Development, 10 had forms of compulsory voting. Australia – Introduced in 1924. Compulsory for federal and state elections for citizens 18 years of age and above. The requirement is for the person to enroll, attend a polling station and have their name marked off the electoral roll as attending, receive a ballot paper and take it to an individual voting booth, mark it, fold the ballot paper and place it in the ballot box. The act does not explicitly state that a choice must be made, it only states that the ballot paper be ‘marked’. According to the act how a person marks the paper is completely up to the individual. In some states, local council elections are also compulsory. At the 2010 Tasmanian state election, with a turnout of 335,353 voters, about 6,000 people were fined $26 for not voting, and about 2,000 paid the fine. Brazil – Compulsory for literate citizens between 18 and 70 years old. Non-compulsory for Brazilian Youth age 16-17 or over 70 or illiterate citizens of any age. A justification form for not voting can be filled at election centers and post offices. Cyprus – Introduced in 1960. Ecuador – Introduced in 1936. Compulsory for citizens between 18 and 65 years old; non-compulsory for citizens aged 16–18, illiterate people, and those older than 65. Luxembourg – Voluntary for those over 70. Nauru – Introduced in 1965. Peru – Introduced in 1933. Compulsory for citizens between 18 and 70 years old, non-compulsory for those older than 70. Uruguay – Introduced in 1934, but not put into practice until 1970. Schaffhausen canton in Switzerland has compulsory voting – Introduced to Switzerland in 1904, but abolished in all other cantons by 1974. Belgium – compulsory for every citizen from 18 it is compulsory to present themselves in a polling station, legal sanctions still exist, but only the sanctions for absent appointed pollingstation staff have been enforced by prosecutors since 2003. Bolivia – Introduced in 1952. Dominican Republic – Compulsory from the age of 18. Indian state Gujarat had passed a bill by legislative assembly in 2011 and approved by Governor of Gujarat in November 2014 which makes voting compulsory in local civic body elections and punishment for not voting.Government of Gujarat chose not to notify law or enforce it citing legal implications and difficulty in enforcement. Paraguay – compulsory for citizens between 18 and 75 years old, non-compulsory for those older than 75. Turkey – the₺22 fine in law is generally not enforced. Although voting in a country may be compulsory, penalties for failing to vote are not always strictly enforced. In Australiaand Brazil, providing a legitimate reason for not voting (such as being sick or outside the country) is accepted. In Argentina, those who were ill on voting day are excused by requesting a doctor to prove their condition; those over 500 km (310 mi) away from their voting place are also excused by asking for a certificate at a police station near where they are. Belgianvoters can vote in an embassy if they are abroad or can empower another voter to cast the vote in their name; the voter must give a “permission to vote” and carry a copy of the eID card and their own on the actual elections. States that sanction nonvoters with fines generally impose small or nominal penalties. However, penalties for failing to vote are not limited to fines and legal sanctions. Belgian voters who repeatedly fail to vote in elections may be subject todisenfranchisement. Singapore voters who fail to vote in a general election or presidential election will be subjected to disenfranchisement until a valid reason is given or a fine is paid. Goods and services provided by public offices may be denied to those failing to vote in Peru and Greece. In Brazil, people who fail to vote in an election are barred from obtaining a passport and subject to other restrictions until settling their situation before an electoral court or after they have voted in the two most recent elections. If a Bolivian voter fails to participate in an election, the person may be denied withdrawal of the salary from the bank for three months.